A few months ago we published a map showing the percentage of filers in each state earning over $200,000. We used the $200,000 figure because of the way the IRS publishes income tax data by state – they don't subdivide their tax data further – and it was the closest figure to President Obama's proposal to let the Bush tax cuts expire for families making over $250K. The Fiscal Cliff compromise that passed a few days ago uses a higher threshold for most of the expired tax cuts – $400,000 (for single filers) and $450,000 (for joint filers.) 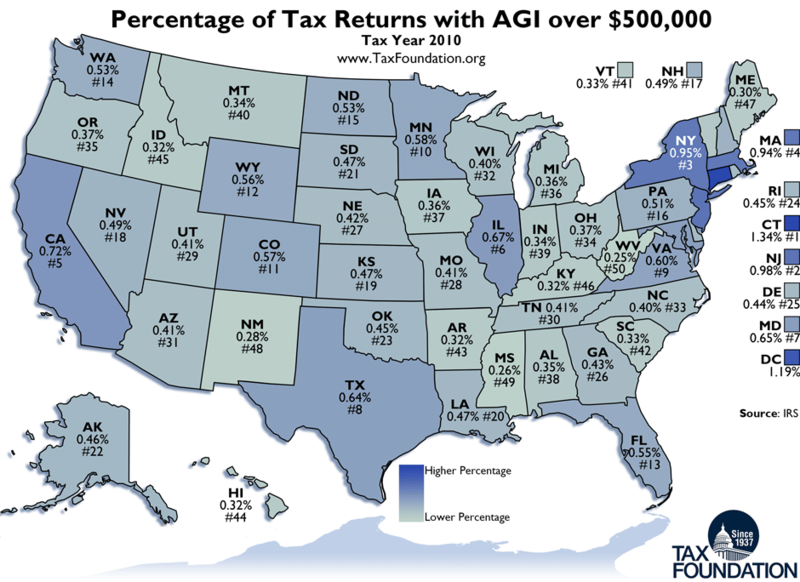 The nearest threshold it's possible to do a map of IRS data with is $500,000, so below, by state, is a map showing the percentage of tax returns with adjusted gross income (AGI) over $500,000.